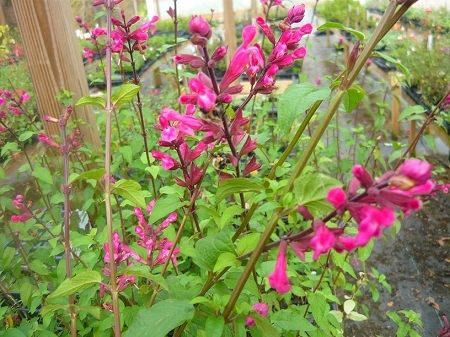 Salvia involucrata x mulberry jam -Also known as roseleaf sage or rosebud sage, this beautiful tall-growing salvia variety features dark green leaves and tall burgundy stems adorned with dark rose pink blooms that hummingbirds adore. Growing up to 5' tall, perfect as a back border in the flower bed. Blooms late Spring and throughout the hot summer months. Perennial zones 9-10. Can survive zone 8 with some winter mulching. Taller plants may be cut back for shipping purposes. Live plant in 3 inch container.